SCIA Engineer 16 provides a complete and elegant solution for the design and assessment of specific sections of concrete members (beams and columns) in a structure. 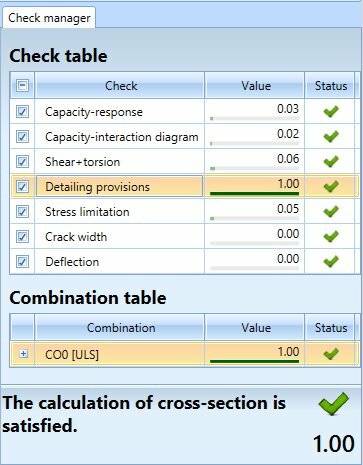 The Section Check is a part of the concrete design module of SCIA Engineer and simplifies both design and checking of sections on 1D concrete members. It provides a clear overview of code checks in a section according to EC EN 1992-1-1 (Concrete buildings design). The main features include definition of reinforcement bars, verification according to standards and generation of reports. The main benefit for the user is the ability to perform directly from the 3D model a fast checking of a single concrete section of a particular 1D member, which means that there is no need to export internal forces and geometry to an external tool. The user simply selects a section on the member, quickly defines and/or edits the reinforcement and the results of the checks are immediately shown for the most critical ULS or SLS combination. Everything is fully integrated in the 3D model in a friendly GUI environment. No need for external standalone applications: both design and checks of a concrete section are fully integrated in the 3D model. Effective and easy use: predefined templates are included, results are clear and immediately available on the screen, all the assumptions applied in calculations are displayed. The design and assessment fully comply with the Eurocode and National standards. Support of all concrete sections from SCIA Engineer cross-section library. The detailed presentation of results as well as the summary of performed checks is always available on the screen. SCIA Engineer 16’s Section Check is an efficient tool that makes sure everything is done safely and with respect of cost-efficiency. The Section Check integrates in the 3D model the opportunity to work with a single section. The easy interface guides engineers how to define reinforcement (longitudinal and shear), perform checks, and compile a report that may be sent to Engineering Report and shared with colleagues. All results are transparent, no black box. Code requirements and calculation process always available on the screen.